Washington (AFP) - A survivor of the September 11, 2001 attacks on New York who was featured in one of the most haunting photographs of the outrage has died of stomach cancer. She was 42. The family of Marcy Borders first announced her death Monday on Facebook. Borders, who was 28 at the time of the attacks, was just one month into a job for Bank of America in one of the Twin Towers. 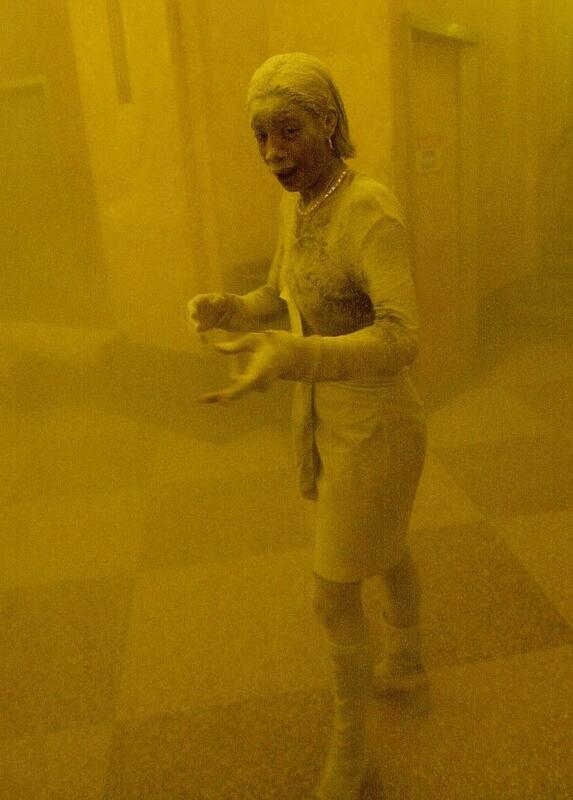 As one of the towers collapsed, she took refuge in a nearby office building, where AFP photographer Stan Honda took a haunting photo of her completely covered in a thick layer of ash, which earned her the moniker "The Dust Lady." The air appeared heavy and a distraught Borders was shrouded in a cloud of dust and backlit by an eerie yellow luminescence. "I can't believe my sister is gone," her brother Michael Borders wrote on Facebook, asking for people's prayers. He later wrote: "She @ peace now!!!" After the attacks, Borders spiraled into a decade-long deep depression and alcohol and drug abuse, though she eventually recovered. She lost her job at Bank of America, where she ignored repeated offers of a transfer. She spent much of her time sequestered in her two-room flat, in one of the poorer parts of Bayonne, a bedroom community in New Jersey over the bridge from Manhattan. Something inside of her had died on that fateful day. "I still live in fear. I can't think about being there, in those targets, the bridges, the tunnels, the (sub­way) stations," she told AFP in a whisper in a March 2012 interview. "The father of my daughter took her ; I can't take care of myself, so I can't take care of her." Her fridge was empty, and her television had long turned silent. "I used to watch TV a lot, the TV was never off," she said. "But now I fear that what happens in Jerusalem will happen here. All that violence... so I leave it off." Borders was relying on her mother for food at the time and said no one had contacted her in the months that followed the attacks and her photo was beamed around the world. No aid organizations helped her and no one had told her that mental services were available for free for 9/11 survivors. "I basically do nothing. I stay indoors ; I feel safe inside," she said. "I feel like I would have had to be killed in order for my daughter to get something. "Sometimes, I think that you have to be the wife of a firefighter or a policeman to get money. It's so depressing, sometimes you're ready to kill yourself." Borders went into rehab in 2011, and has said that news of the death of Al-Qaeda leader Osama bin Laden helped her regain peace and recover from her trauma. Her family said she had fought cancer for a year. After her diagnosis, she suggested in interviews that her exposure to chemical pollutants emitted by the World Trade Center collapse likely had a role in her illness. How they keep referring to her as the "dust lady." It makes her sound like a prop. Jon Gold on Thu, 08/27/2015 - 10:32am.